Researchers at PNNL and BPA have identified two possible sites in eastern Washington state to build compressed air energy storage facilities that could temporarily store the Northwest's excess wind power. 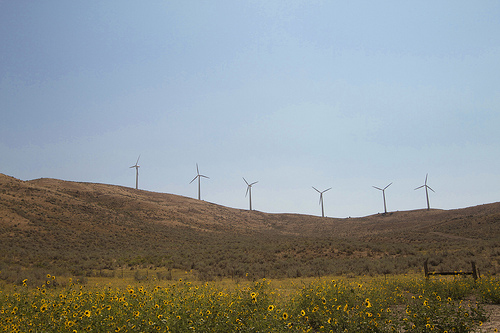 Pictured here is a wind power project in eastern Oregon. The Department of Energy's Pacific Northwest National Laboratory and the Bonneville Power Administration have identified two locations in eastern Washington state that could store enough Northwest wind energy to power about 85,000 homes each month. 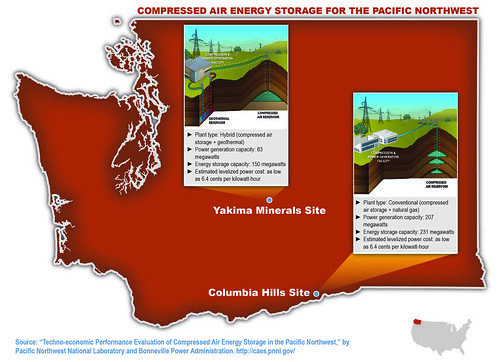 Researchers at PNNL and BPA have identified a site they call Columbia Hills north of Boardman, Ore., on the Washington state side of the Columbia River, that could house a 207-megawatt conventional compressed air energy storage facility. Researchers at PNNL and BPA have identified a site they call Yakima Minerals that is about 10 miles north of Selah, Wash., and could house an 83-megawatt geothermal compressed air energy storage facility. RICHLAND, Wash. — Enough Northwest wind energy to power about 85,000 homes each month could be stored in porous rocks deep underground for later use, according to a new, comprehensive study. Researchers at the Department of Energy's Pacific Northwest National Laboratory and Bonneville Power Administration identified two unique methods for this energy storage approach and two eastern Washington locations to put them into practice. Compressed air energy storage plants could help save the region's abundant wind power — which is often produced at night when winds are strong and energy demand is low — for later, when demand is high and power supplies are more strained. These plants can also switch between energy storage and power generation within minutes, providing flexibility to balance the region's highly variable wind energy generation throughout the day. "With Renewable Portfolio Standards requiring states to have as much as 20 or 30 percent of their electricity come from variable sources such as wind and the sun, compressed air energy storage plants can play a valuable role in helping manage and integrate renewable power onto the Northwest's electric grid," said Steve Knudsen, who managed the study for the BPA. 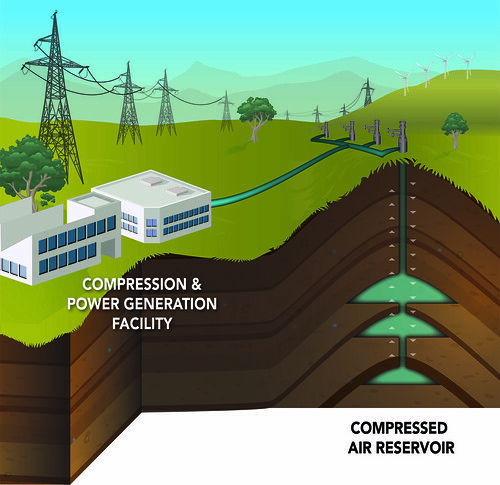 All compressed air energy storage plants work under the same basic premise. When power is abundant, it's drawn from the electric grid and used to power a large air compressor, which pushes pressurized air into an underground geologic storage structure. Later, when power demand is high, the stored air is released back up to the surface, where it is heated and rushes through turbines to generate electricity. Compressed air energy storage plants can re-generate as much as 80 percent of the electricity they take in. The world's two existing compressed air energy storage plants — one in Alabama, the other in Germany — use man-made salt caverns to store excess electricity. The PNNL-BPA study examined a different approach: using natural, porous rock reservoirs that are deep underground to store renewable energy. Interest in the technology has increased greatly in the past decade as utilities and others seek better ways to integrate renewable energy onto the power grid. About 13 percent, or nearly 8,600 megawatts, of the Northwest's power supply comes from of wind. This prompted BPA and PNNL to investigate whether the technology could be used in the Northwest. To find potential sites, the research team reviewed the Columbia Plateau Province, a thick layer of volcanic basalt rock that covers much of the region. The team looked for underground basalt reservoirs that were at least 1,500 feet deep, 30 feet thick and close to high-voltage transmission lines, among other criteria. They then examined public data from wells drilled for gas exploration or research at the Hanford Site in southeastern Washington. Well data was plugged into PNNL's STOMP computer model, which simulates the movement of fluids below ground, to determine how much air the various sites under consideration could reliably hold and return to the surface. Analysis identified two particularly promising locations in eastern Washington. One location, dubbed the Columbia Hills Site, is just north of Boardman, Ore., on the Washington side of the Columbia River. The second, called the Yakima Minerals Site, is about 10 miles north of Selah, Wash., in an area called the Yakima Canyon. But the research team determined the two sites are suitable for two very different kinds of compressed air energy storage facilities. The Columbia Hills Site could access a nearby natural gas pipeline, making it a good fit for a conventional compressed air energy facility. Such a conventional facility would burn a small amount of natural gas to heat compressed air that's released from underground storage. The heated air would then generate more than twice the power than a typical natural gas power plant. The Yakima Minerals Site, however, doesn't have easy access to natural gas. 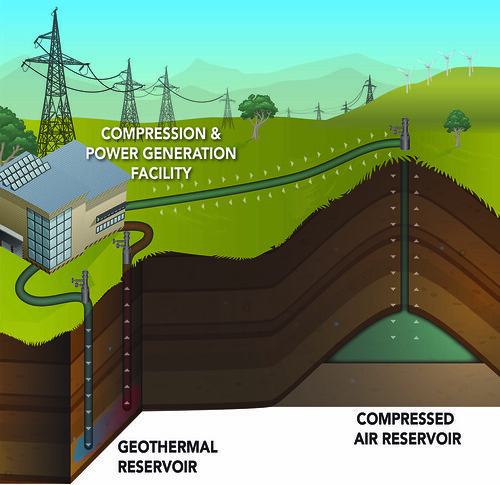 So the research team devised a different kind of compressed air energy storage facility: one that uses geothermal energy. This hybrid facility would extract geothermal heat from deep underground to power a chiller that would cool the facility's air compressors, making them more efficient. Geothermal energy would also re-heat the air as it returns to the surface. "Combining geothermal energy with compressed air energy storage is a creative concept that was developed to tackle engineering issues at the Yakima Minerals Site," said PNNL Laboratory Fellow and project leader Pete McGrail. "Our hybrid facility concept significantly expands geothermal energy beyond its traditional use as a renewable baseload power generation technology." The study indicates both facilities could provide energy storage during extended periods of time. This could especially help the Northwest during the spring, when sometimes there is more wind and hydroelectric power than the region can absorb. The combination of heavy runoff from melting snow and a large amount of wind, which often blows at night when demand for electricity is low, can spike power production in the region. To keep the regional power grid stable in such a situation, power system managers must reduce power generation or store the excess power supply. Energy storage technologies such as compressed air energy storage can help the region make the most of its excess clean energy production. Working with the Northwest Power and Conservation Council, BPA will now use the performance and economic data from the study to perform an in-depth analysis of the net benefits compressed air energy storage could bring to the Pacific Northwest. The results could be used by one or more regional utilities to develop a commercial compressed air energy storage demonstration project. The $790,000 joint feasibility study was funded by BPA's Technology Innovation Office, PNNL and several project partners: Seattle City Light, Washington State University Tri-Cities, GreenFire Energy, Snohomish County Public Utility District, Dresser-Rand, Puget Sound Energy, Ramgen Power Systems, NW Natural, Magnum Energy and Portland General Electric. Plant type: conventional, which pairs compressed air storage with a natural gas power plant. Location: 10 miles north of Selah, Wash.
REFRENCE: BP McGrail, JE Cabe, CL Davidson, FS Knudsen, DH Bacon, MD Bearden, MA Chamness, JA Horner, SP Reidel, HT Schaef, FA Spane, PD Thorne, "Techno-economic Performance Evaluation of Compressed Air Energy Storage in the Pacific Northwest," February 2013. BPA is a nonprofit federal agency that markets renewable hydropower from federal Columbia River dams, operates three-quarters of high-voltage transmission lines in the Northwest and funds one of the largest wildlife protection and restoration programs in the world. BPA and its partners have also saved enough electricity through energy efficiency projects to power four large American cities. For more information, contact us at (503) 230-5131.